With each stroke of the paintbrush, self-taught artist Clayton Conner has been adding color to the Last Frontier for the last four years in the form of historic murals. His museum-like displays have given many an extra reason to visit Skagway. One of his pieces can be found on the exterior wall of the Westmark Inn Skagway. As part of a renovation last May, we worked with Clayton to showcase the history of “The Gateway to the Klondike” in our very own mural. The piece was painted in sepia style with subtle, old-photo coloring. It’s the kind of mural that a person can find something new in every time they look at it. At the forefront, a woman in a beautiful dress gazes toward an image of old downtown and a proud-looking prospector with gold pan in hand. Old newspapers, maps and a prominent train can also be spotted in the mural. Clayton’s talent cannot be denied. His love for art began in California where he began drawing at an early age. Since then, he has painted over 100 murals from San Diego to Portland and beyond. He has been in Alaska since 2015, focused on creating art in schools and teaching everyone how valuable art is and how easy it can be. His mural at Westmark is loved by hotel guests and Skagway locals alike. Sometimes there are 50 people in a day who stop and take a photo in front of the scene. Oftentimes, visitors stop at the mural before they even reach the front desk to check in! One of the best parts of the mural is hidden in plain sight. Clayton cleverly painted thank you messages into the mural for those that commissioned the painting, hotel staff and the construction crew that was responsible for the most-recent remodel of the facility that occurred simultaneously with the mural creation. 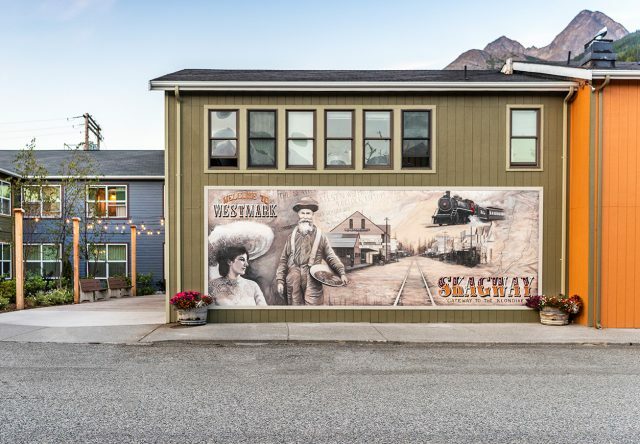 If you’re planning a stay at the Westmark Inn in Skagway, make sure to commemorate your trip with a photo in front of this classic mural.